Good morning polished world! How are you all doing today? It's Friday and the beginning of a three day weekend, so you know I am the happiest person in the whole wide world right now. I cannot wait to sleep in on Monday. Although it will throw my whole week off, but it will be worth it. Since it's one of the first posts of September, that means it is time for me to introduce you all to another talented nail artist. I am pleased to introduce you all to Emma from Emspire on Instagram! Em is beyond talented and it is a shock to me that she doesn't have more followers! Time to hand the blog over to Emma! My name is Emma from California and the gal behind @emspire. Like many of you I also have a nail polish, nail art addiction. My obsession started back in 2010 when I first discovered nail stamping (I wasn't very good at it but I thought I was the ish lol). I continued to polish my nails through out the years but it wasn't until about a year ago that I decided to share my nail creations on Instagram. Ok so that's a little background on how and when I got started but it's now time to move onto my mani... I was having a hard time trying to decide what to do. Aside from free hand nail art I live for a good glitter gradient so that's exactly what I went with. 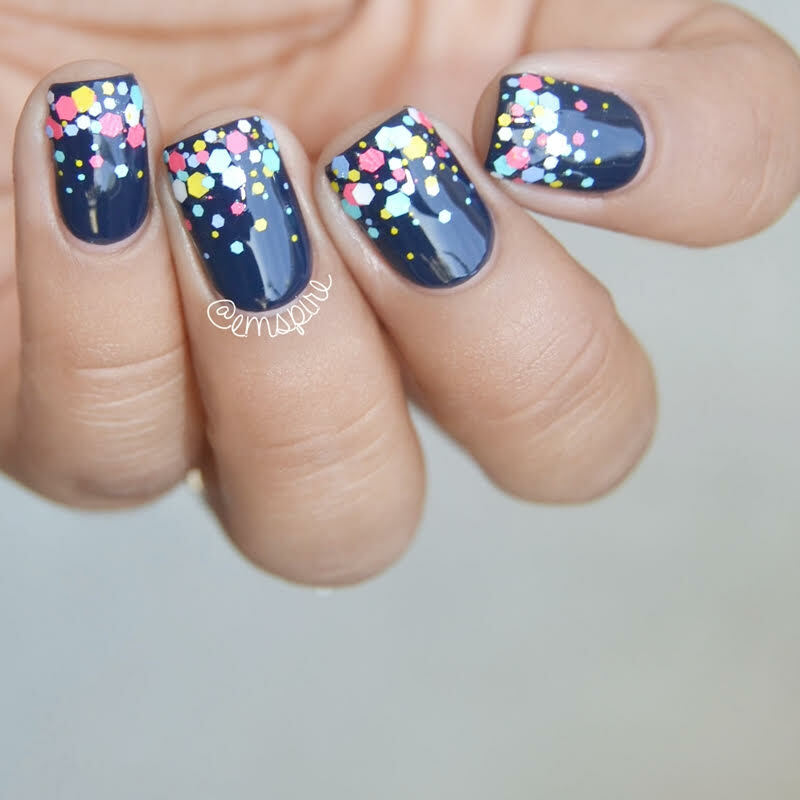 Something simple and cute that anyone can recreate. I started off by applying two coats of a creamy darker colored polish. Then I sponged on some of these hexagons on my tips. & finally topping everything off with my favorite top coat. *Picking a darker polish will help the bright hexagons stand out. I want to thank everyone that took the time to read my post but a very special thank you to Alaina for choosing me as her Artist of the Month. I love this manicure so much. 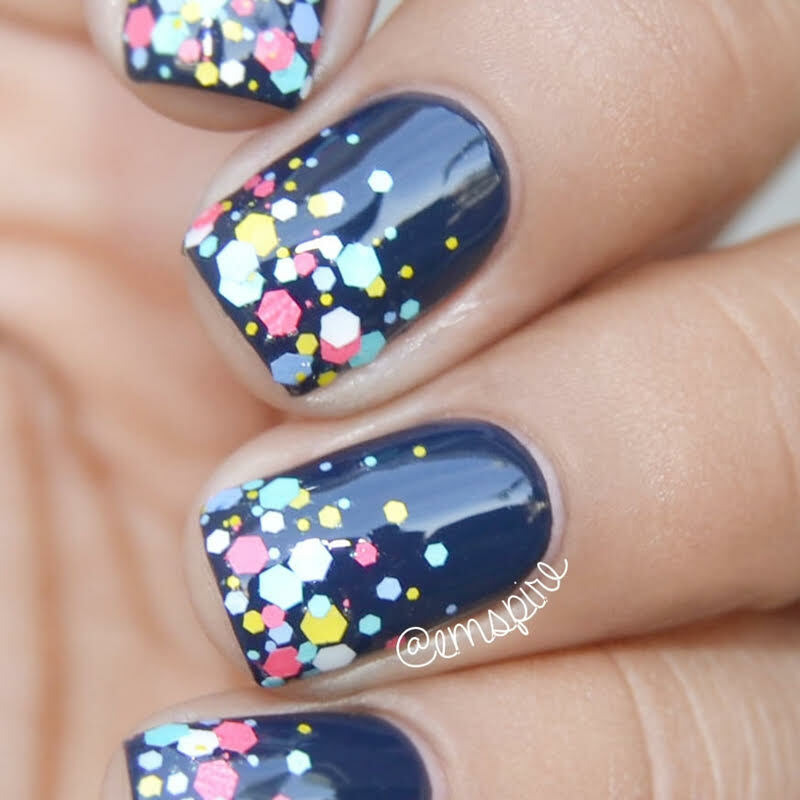 The blue, the fun bright glitters, the perfect gradient! Ahhh I love it all!!! I wish I could do a glitter gradient like this. Every single time I have tried, my nails look like blobbed messes. Make sure to follow Em on Instagram! Thank you again for this awesome post! !